West of the metropolis of Tokyo lies Chichibu Tama Kai National Park, a protected area home to the sacred Mount Mitake. This majestic mountain has been a site of Shinto worship for thousands of years and the surrounding national park is scattered with ancient shrines. At the mountains peak, there is a Shinto shrine built under Emperor Sujin in 90 B.C. which contains a statue built in 736. From this ancient area of worship comes a special form of Kagura, sacred Japanese song and dance rituals. 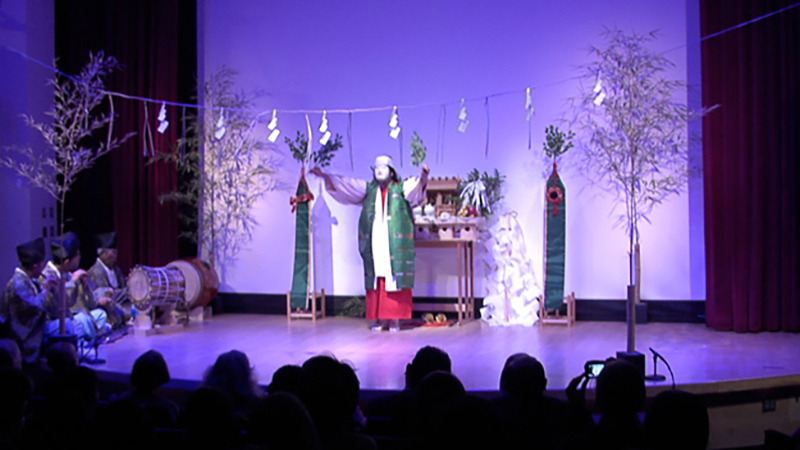 In this video, the East Asia Center and East Asian Languages and Cultural Studies at UC Santa Barbara present the first and only US performance of Chichibu Kagura. These particular songs and dances date back the the seventeenth century. For more world dance, check out this video of dances choreographed by John Malashock as he collaborates with Japanese artist Junko Chodos.